Sometimes I sign up for a blog tour because I'm intrigued by the pattern, I have the perfect fabrics in my stash, or it's from a favorite designer. Sewing the Jeune Twin Set by Sew Pony combined these reasons plus I thought this might be a perfect pattern to suggest to beginning sewists. The verdict: I will highly recommend the Jeune Twin Set pattern to someone learning to sew for a few key reasons. The top has no exposed seams or set in sleeves. When first learning to sew, finishing seams is one more step to learn. A new sewist can skip that step with this top, but then learn it when sewing the skirt. The blouse has several options including a rounded back neckline, straight hem, and collar. The simple button back closure is so classic rounding out another skill for the beginner to practice. From a distance the top fabric, Bloom Geo Blossom by Riley Blake, looks like simple dots, but the white on gray geometric print is much more interesting. Be sure to grab the Riley Blake Solid in Peacock for a perfect coordinate. 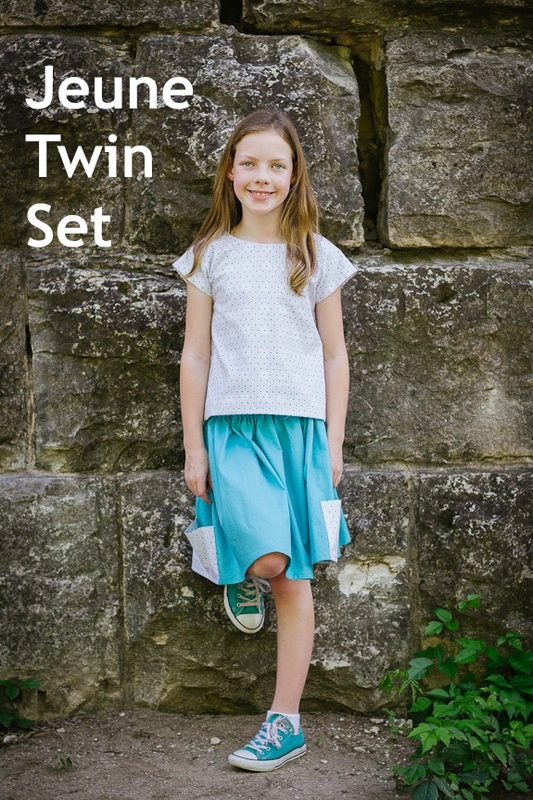 The skirt portion of the twin set is a few simple rectangles, but the side pockets provide a fun detail. Avery already had a tiny shell or two stored away by the end of this photo shoot. Sewing the skirt gives a beginner experience with sewing a hem, finishing side seams, and inserting elastic in a casing. I'd venture to say that the Jeune Twin Set pattern would make a great instructional pattern if you are planning to teach someone to sew. Suz has organized a full blog tour this week, so be sure to check out all of the other inspiration. A 10% discount will apply throughout the tour with the code JEUNETOUR (May 2 - May 12). Also, the pattern is available in English as well as Dutch. Visit WenSJe and My Petite Sophie for their stops on the tour today.